These are the star of any party, and so simple to make since I’ve partnered with OXO, a brand you all know by now that I totally love, as my kitchen is full of their very practical, functional and affordable products. They supplied the Baker’s Decorating Tool, Muffin Pan for this post. All opinions are my own. These are awesome products. I baked these in honor of Cookies for Kids’ Cancer. Oxo will be donating $100 to Cookies for Kids’ Cancer for each blog post (up to their $100,000 commitment*). I participated last year with these amazing salted chocolate caramel cookie bars and was happy to do it again. In order to participate, Oxo allowed me to choose from a few different sets of baking products. I chose the muffin/cupcake set because I really wanted the frosting decorator tool. 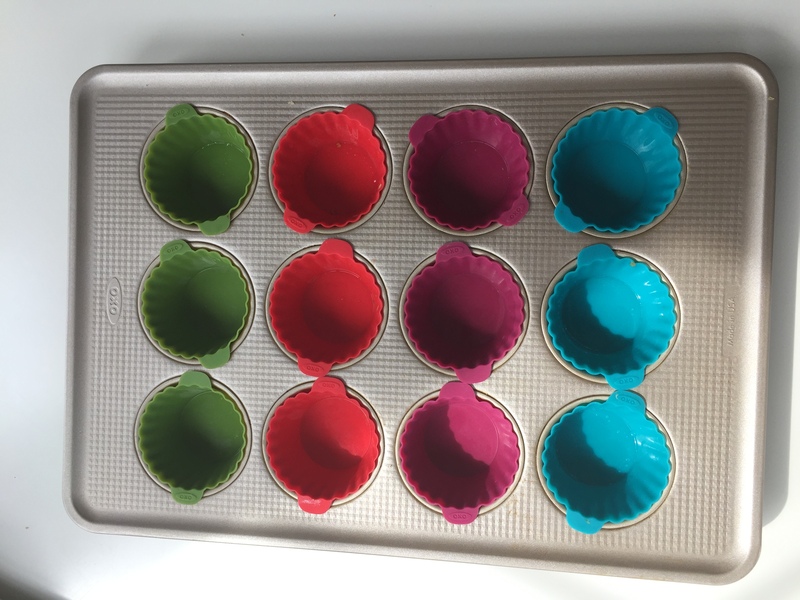 To my great surprise I also ended up falling in love with their silicone muffin cups (using them to freeze pesto, and to bake crustless mini-quiche). I was so impressed with the silicone, I ordered a set for a friend (Nothing sticks and they are easy to wash, unlike many other silicone cups). The tools they sent that made this so easy included silicone cups, an OXO muffin pan, and my new most favorite gadget, the frosting decorating tool, that means I never need a pastry bag again. The muffin pan is a commercial grade that has easy clean release and square rolled edges making it easy to take out of a hot oven without putting my pot holder in a cupcake! It does not come with the silicone cups. They are sold separately. The OXO Baker’s Decorator Tool comes with two couplers, six stainless large and small tips and a tip for filling cupcakes. .The unique trigger provides a smooth stream of icing for clean lines, and the comfortable handles ensure a steady grip and protect icing from warm hands. I was inspired by the filling tip and decided to fill my chocolate cupcakes with peanut butter frosting. This couldn’t be easier. You can use the larger end of the tip to remove some of the cupcake, then just fill away. Or you can just fill without removing any cupcake. I removed some because I wanted a lot of filling. You can see I played around quite a bit with the various tips. There are two kinds here. I made a combination of gluten free chocolate cupcakes and regular chocolate cupcakes. I used the OXO Decorator Tool to fill and to frost. My Regular Chocolate Fudge Cupcake is one of the most popular here at Spinach Tiger. The Gluten Free Chocolate Fudge Cupcake is wonderful and that recipe is here along wiht a chocolate fudge frosting. The regular Chocolate Fudge Cupcake is incredible, but makes 4 dozen cupcakes (great for parties). I’ve listed it here again making only two dozen mid-sized cupcakes for your convenience. 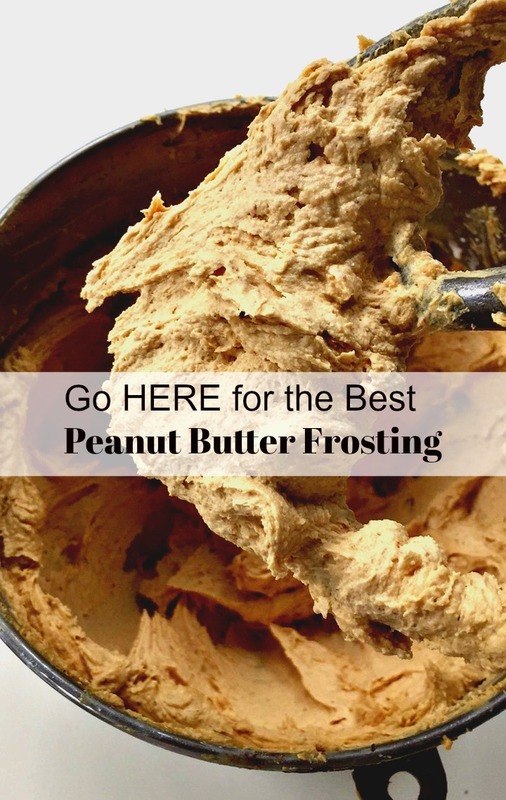 The Peanut Butter Frosting recipe is here. You can make this easy chocolate ganache recipe a few different ways. It all depends on how thick or how glossy you want it. If you want it glossy, you add butter. I tend to not add butter unless I’m making a cake. Instead I use a high fat chocolate (70%). Use 8 ounces of high quality chocolate for every cup of heavy cream. If using butter, use 1 tablespoon. In this recipe, I halved that and had enough because I didn’t use a lot of the ganache, relying more on the frosting. Just to let you know, these cupcakes are doing double duty. They are raising money for Cookies for Kids’ Cancer sponsored by OXO, and they will be sold Saturday in Nashville at the Sweet Relief Bake Sale for Hurricane Harvey Victims. 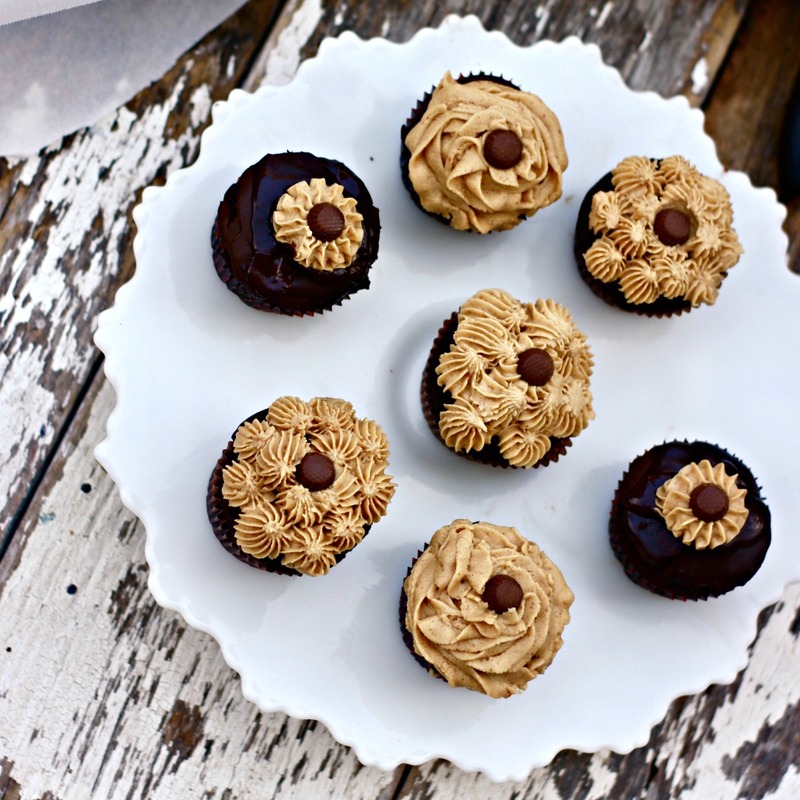 Chocolate Fudge Cupcakes with peanut butter filling, chocolate ganache. Cream butter and sugar. Mix until creamy and smooth. Add in eggs, one at a time and beat each for one minute. Sift together all dry ingredients. Flour, Salt, cocoa powder, baking soda. Add all dry ingredients and milk to the mix until well incorporated. Test with cookie tester which should come out clean. Chop chocolate in small pieces and put in small bowl. Heat cream on medium low heat until bubbling. Pour hot cream over the chocolate. Allow to sit for five minutes. If you are using butter, add ½ tablespoon, make sure it is softened and add now. Using a circular motion, stir, and continue to stir until completely smooth. To : Completely cool. Use a cupcake corer to make room for filling. Top with a thin layer of chocolate ganache. Allow to set for about 15 minutes. 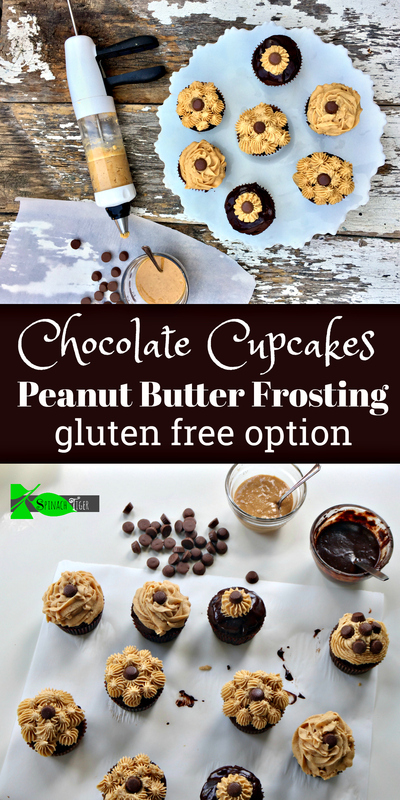 Add a small dollop of peanut butter frosting and a peanut butter cup for garnish. The recipe makes 24 small-sized, NOT MINI) cupcakes. Adjust your frosting accordingly. 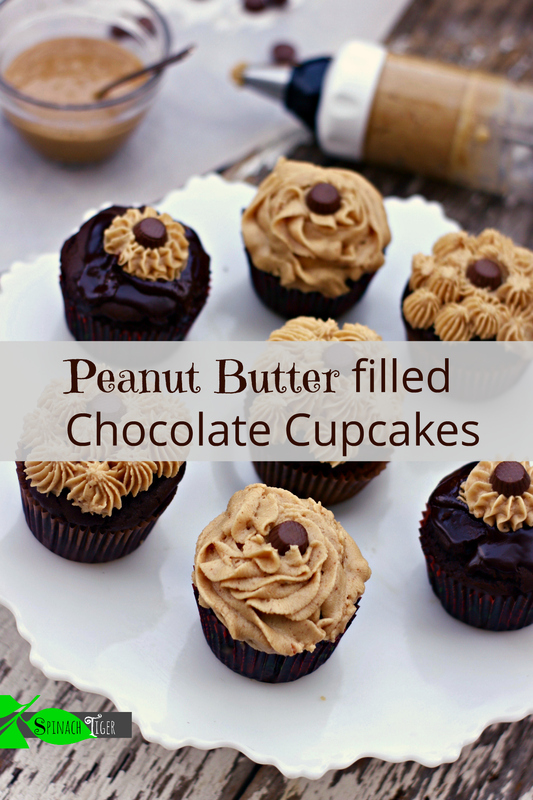 If you are making filled cupcakes, the peanut butter recipe should be enough. If you are topping the cupcakes (not filling), you will need to double the recipe. Regarding the chocolate ganache, a little goes a long way. Just amazing! Loved it and i like your explanation in your cake recipe!